A “phobia” may be defined as: Any objectively unfounded morbid dread or fear that arouses a state of panic. Common phobias include claustrophobia (fear of confinement), agoraphobia (fear of open spaces), and acrophobia (heights). In many cases, successful therapy for these phobias involves facing them head on. Michaelis lamented how chemophobia was being drilled into the heads of young children. As an example, he cited the case of 151 “chemistry drawings” produced by children from Basel, the center of Switzerland’s chemical industry. Most of the drawings showed mindless fear, represented by skulls, skeletons, TNT and other explosives, and above all by the thick black smoke emanating from factory chimneys—even if by 1996 there was precious little black smoke suffocating Basel. What are to we report 13 years later? 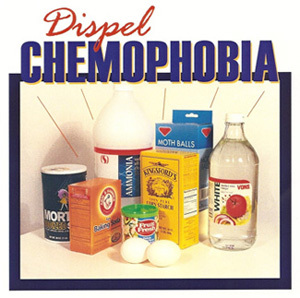 Sadly, chemophobia is more widespread than ever. Just today, I got an e-mail from an undergraduate student asking earnest questions about the dangers of exercising amidst toxic air pollutants. I suppose one could argue that strenuous exercise would cause the “victim” to breathe in more of these pollutants than his sedentary counterpart. But, this assumes that the air in unhealthy to begin with. Even then, we must distinguish between temporary and long-term effects. During the worst smog alerts in Los Angeles, your eyes would burn, and sometimes you might even feel it in your nose and throat. These acute effects (pre-EPA and other regulations) were undeniable, but what was the endpoint? Was there permanent eye or nasal damage? Did some form of cancer occur? Maybe a large epidemiological study will be run in the late 21st century, looking back at baby boomers who lived in Los Angeles, to see if their mortality was affected by smog. So far, though, all we can say is that on smoggy days, your eyes burned, and this cleared up by the next day, with no long-term effects. The same student referred to the Beijing Olympics, whereby there was a “huge risk” to the athletes because of air pollution. I suggested that he rethink “huge risk.” Studies done by Dr. James Barnard of UCLA, prior to the 1984 Olympics, showed only very small effects of air pollution on athletic performance, and could not correct for any psychosomatic factor of exercising under polluted skies. The FEMA trailer fiasco created its own brand of chemophobia. Even though CDC testing of hundreds of trailers showed a very low geometric mean concentration of 77 parts-per-billion, formaldehyde became the crisis du jour, and countless victims appeared. Some actually lived in the trailers, others were harmed by bras supposedly laced with the chemical, still others were being damaged by trace amounts in cosmetics. Another problem is lack of any sense of scale. The guiding principle of toxicology, stated by Paracelsus in the 16th century, is “All things are poison and nothing is without poison, only the dose permits something not to be poisonous.” This is usually colloquialized to “The dose makes the poison.” It is well worth remembering that this precept has stood the test of time, is quoted in every toxicology textbook, and is the basis for the entire field of pharmacology. Some researchers have attempted to show exceptions to this rule by positing low dose effects of various estrogenic substances on animals. However, many of these tests were done in cell culture, and not in the whole animals. In one case, paradoxical effects were shown on obesity in mice, but no mechanism was proffered. Moreover, there is a substantial history of human exposure to such compounds, and Paracelsus’ rule is very much in effect. Alarmists will identify a known toxic chemical, present in an infinitesimally small amount in some product, and then attempt to scare people as if the chemical were a deadly toxin at any concentration. Thus, we have the absurd situation whereby people are trying to “free themselves” of formaldehyde, even though it is a metabolite in all animals, is present in human breath at a median concentration of 30 parts-per-billion, and naturally occurs in fruits and vegetables. Note that this metabolic formaldehyde occurs naturally, and has nothing whatsoever to do with environmental pollution. Please consider the magnitude of how stupid this is. We are all walking around half-embalmed, I guess. In reality, the amount of embalming fluid used is determined by the size and condition of the body, and these amounts have not changed in the last 20 years. If this absurdity somehow were true, does it mean that the mortician first runs an assay on the body to determine how much formaldehyde it already contains, so he can pocket the savings? Fear not. Formaldehyde is normally present in human blood at a steady-state concentration of around 1 to 2 parts-per-million, 100,000 times less than what is needed for embalming. Besides, formaldehyde does not accumulate in the environment, as it quickly breaks down in the body and the atmosphere. Chemophobes, face your fears and conquer them!